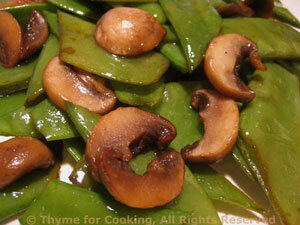 Sautéed Snow Peas and Mushrooms, Thyme for Cooking spring sides. The mushrooms give a bit of meaty flavor and 'weight' to the delicate snow peas and contrast nicely with their crisp crunch. Heat oils and soy sauce in a nonstick skillet over medium heat. Add snow peas, mushrooms and sauté 5 - 7 minutes, depending on size, stirring frequently. Taste, when they are done to your liking, remove and serve.